(NaturalNews) Democratic presidential nominee Hillary Clinton embodies all that is wrong with American politics today, as she has proven time and again. 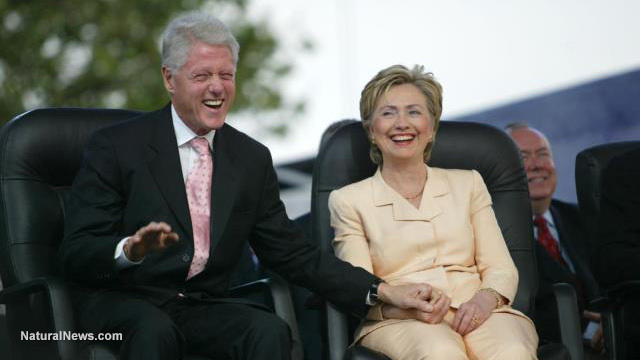 One example unearthed just recently involves her policy reversal regarding a dangerous chemical, after the company that manufactures it became a benefactor of the Clintons' charities. As reported by Breitbart News in February, at one time Clinton opposed use of an industrial solvent manufactured by Dow Chemical known as Trichloroethylene, or TCE, because it was found to be potentially harmful to pregnant women. But she changed her mind after the nation's largest maker of TCE began partnering with, and eventually contributing to, the Clinton Global Initiative and an advisory group linked to her husband, former President Bill Clinton. Not so ironically, at the time of the Breitbart report Clinton was making an issue of the government-created toxic water crisis in Flint, Mich., in which residents were saturated with dangerous levels of lead. Lead poisoning: bad; chemical poisoning: not so much (for donors, anyway). Clinton's personal and financial partnership with Dow Chemical reveals much about the inner workings of her and her husband's growing financial empire, as well as the "pay for play" nature of her political life. On October 5, 2005, then-U.S. Sen. Clinton, D-N.Y., drafted a letter to the Environmental Protection Agency's administrator, Stephen L. Johnson, noting that seniors and children are especially vulnerable to the toxic effects of the chemical, used primarily as a metal degreaser. She then urged the agency to adopt regulatory measures to prevent possible harm from the chemical. "Endicott, Hopewell Junction and Ithaca [New York] are known to be contaminated with volatile organic compounds where TCE is also known to be present," Clinton's office said at the time in a statement which highlighted the letter. At the time, there was intense political pressure on Clinton and her New York lawmaker colleagues, after it was found that TCE had leached into an underground water table near Hopewell Junction. In addition, a number of homes had experienced "vapor intrusion" of the chemical into their homes. Both of these incidents caused significant threats to public health, as most residents were likely not purifying their water or cleaning the air in their houses. Also, noted Breitbart, the EPA reported discovering other toxins in the well water of at least five homes in the Hopewell Junction community while testing was being conducted for the presence of TCE. "TCE is a widespread pollutant in the United States and vapor intrusion is known to be a significant pathway of exposure," Clinton, who took the lead, said in her letter, which was signed by other senators and congressmen. "The EPA needs to act now to establish safe, protective 'interim standards' in order to ensure the health and safety of our children and our communities." In 2007, Clinton would introduce legislation that made clear that TCE was potentially harmful to "pregnant women, infants, and children." Shortly after Clinton introduced her measure, Dow began partnering with the Clinton Global Initiative, eventually working up to being a benefactor. The company pledged a $30 million loan guarantee for a clean water projection in India at the Clinton Global Initiative's 2007 annual meeting. Andrew Liveris, Dow's chairman and CEO, announced the loan while appearing at the annual meeting in late September 2007, less than two months after Clinton introduced her TCE Reduction Act. Breitbart noted that Liveris became a close friend of the Clintons, with Dow donating between $1 and $5 million to the Clinton Global Initiative in 2014. Liveris also gave Bill Clinton the use of a private Dow jet when the former president went to North Korea in 2009 to successfully negotiate the release of two American journalists who were being held in that country. There are other ties as well, Breitbart noted. But in sum, this is just another example of how the principles of Bill and Hillary Clinton are not hard-and-fast ideological things, but are instead for sale to the highest bidder.